This recipe is a very easy way to fix an impressive dessert. 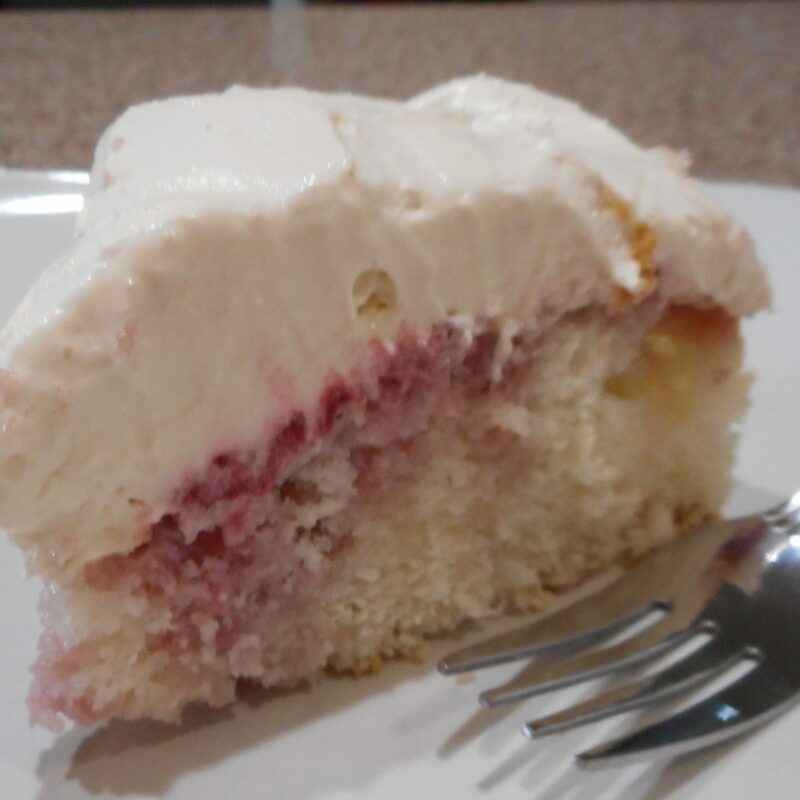 It uses a boxed cake mix and just a few other simple ingredients. You can make it with fresh strawberries or frozen, but as always, fresh is best. The original recipe called for a 9×13″ baking dish, but I used two 8″ round cake pans. After the cakes had been chilled several hours to set, I removed one from the pan, wrapped it well, and froze it. 1/4 cup strawberry juice, reserved from above. 2. Preheat oven to 350°. Grease and flour a 9×13″ or two 8″ round cake pans. 3. Prepare the cake mix as directed on the box, substituting milk for the water. Bake as directed. 4. While cake is still hot, poke holes in top with skewer or fork. 6. Remove caps, wash and slice one quart of fresh strawberries. 7. In a medium saucepan, combine the strawberries and 1/2 cup sugar. Cook on medium heat for about 5 minutes, stirring constantly. Remove from the heat and set aside. Reserve about 1/4 cup of the strawberry juice for the icing. 8. Spoon the strawberry mixture over the top of the hot cake. Set cake aside and let cool. 10. 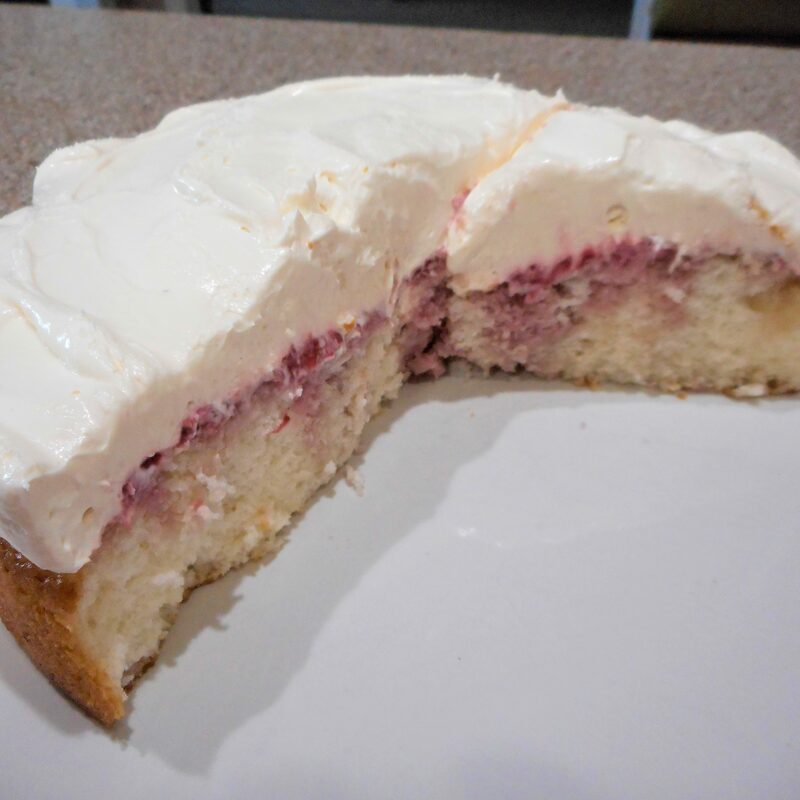 In a large mixing bowl, combine the cream cheese, remaining 1/2 cup sugar, vanilla and reserved strawberry juice. Mix to incorporate ingredients. 12. Spread on cool cake, refrigerate for at least one hour or overnight.